Paperchase has promised not to run any more promotions in the Daily Mail following a backlash from an online activist group which has criticised its news stories. 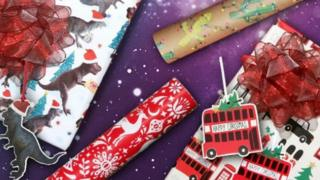 The stationery firm offered free wrapping paper in Saturday's newspaper. But on Monday, it said: "We're truly sorry and we won't ever do it again." A Daily Mail spokesman said: "It is deeply worrying that Paperchase should have allowed itself to be bullied into apologising." Following the promotion, Stop Funding Hate tweeted: "After a torrid few weeks of divisive stories about trans people, is a Daily Mail promotion really what customers want to see @FromPaperchase?" Stop Funding Hate is an lobby group which targets companies to stop advertising with the Mail, the Sun and the Daily Express. Last year, Lego ended its promotional giveaways in the Daily Mail following a campaign by the online activists. After a number of individuals also contacted Paperchase, it initially said: "Thank you for taking time to share your opinion. We genuinely like to know what customers think about us - even though on this occasion some of your feedback is uncomfortable to hear. We promise to review in detail all customer feedback on this promotion." In response, a spokesman for the Daily Mail, said it has only run one promotion with Paperchase which is not an advertiser. It added that it "had no plans for any more, so it is disingenuous of them to say it won't be repeated". He said: "However it is deeply worrying that Paperchase should have allowed itself to be bullied into apologising - on the back of a derisory 250 Facebook comments and 150 direct tweets - to internet trolls orchestrated by a small group of hard left Corbynist individuals seeking to suppress legitimate debate and impose their views on the media. "Has the company considered what message they are sending to the four million people who read the Daily Mail on Saturday, many of whom will be their customers? "It is one of the fundamental principles of free and fearless journalism that editorial decisions are not dictated by advertisers or commercial partners, and we are sure anyone who values freedom of expression will be as appalled as we are by Stop Funding Hate's attempts to threaten the Mail and other newspapers." A spokesman for Stop Funding Hate, said: "We are on the side of freedom of speech. What happened over the weekend was that hundreds, if not thousands, of people exercised their freedom of speech and Paperchase exercised its freedom of choice."